Another in a series of short articles, outlining the scope of the nine research projects which are currently being undertaken, funded by CONNECTED in the first phase of pump-prime funding. To real all the available articles use this link. Maize Lethal Necrosis (MLN) disease threatens the production of maize, the Eastern African region’s main staple food. Maize chlorotic mottle virus (MCMV) acts as the main driver of MLN disease. A number of insect vectors associated with its transmission have been reported, based on studies in countries outside Africa, whose farming systems differ greatly. 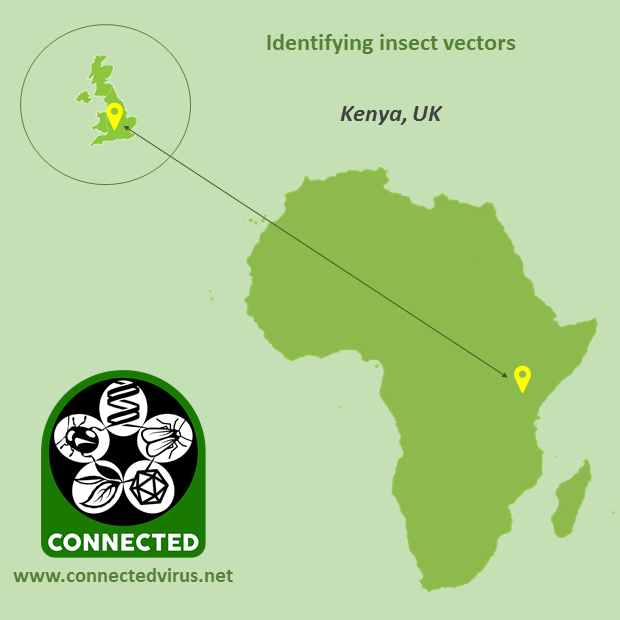 These insect species have been assumed to be the main vectors of MCMV in Africa, but no systematic studies have been conducted in Kenya and Eastern Africa to substantiate this, or to determine whether additional insect vectors are present. There is a need to identify and confirm insect vectors associated with the transmission of MCMV in the region. This project is taking insect and host plant samples from fields of differing prevalence of MCMV and surveying Kenya’s main maize growing regions to collect putative MCMV insect vectors and their hosts.